In a small saucepan on medium-high heat, combine sugar and water. Add cinnamon sticks. Stir until sugar is dissolved and mixture is clear, about 3 minutes. Remove from heat and cool. Store in an airtight, glass container with cinnamon sticks. Make the cinnamon sugar and rim the glasses. In a bowl, stir together sugar and cinnamon until evenly mixed. Pour onto a plate or into a shallow bowl that’s big enough for the glass. To rim the glass, brush a small amount of the simple syrup around the outer rim of an old-fashioned or rocks glass. Roll the outer edge of the glass in the cinnamon sugar until coated. Set aside. 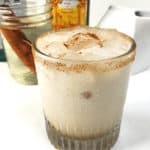 In a cocktail shaker filled with ice, combine vodka, coffee liqueur, heavy cream and cinnamon simple syrup. Shake vigorously, then pour into prepared cocktail glass. Serve immediately.